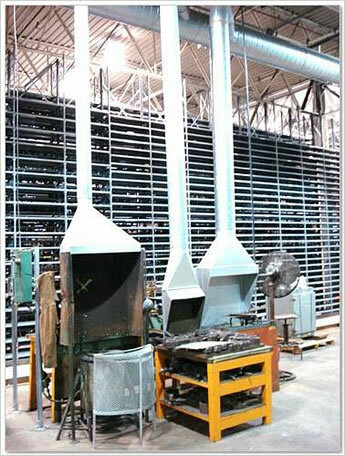 On December 5th, I attended the public auction of the Gorham Silver Factory in Egg Harbor City, New Jersey. The plant consisted of machinery and tools that had been consolidated into the New Jersey location as other plants were closed. The auction was hosted by Jay Sugarman Auctioneers out of Miami Florida. They were scheduled to sell the entire operation in one day. 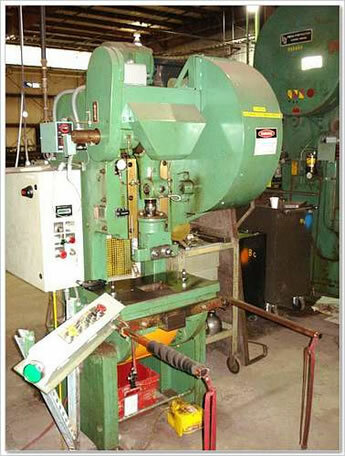 There was no woodworking machinery listed in the sale, but there were a number of Stanley Vidmar cabinets. I’ve been hoping to get some of these for awhile, so I figured it was worth the two hour trip to southeastern Jersey. The sale started with several hundred lots of miscellaneous tools. The pricing on these items was exceptionally good. I picked up a complete [SKF] bearing puller kit that was still shrink wrapped for $35. I also ended up with a urethane belt splicer for $15, a second bearing puller kit for $10, a box full of wheel/bearing pullers for $45, a pipe flaring kit for $15, a 5 ton toe jack for $25, a complete set of morse tapers for a milling machine (new in boxes) for $5, a needle scaler for $5, a very nice Starrett dial caliper for $15, an SK 3/4″ socket set with breaker bar for $25, and a few box lots of misc tools for $5 each. 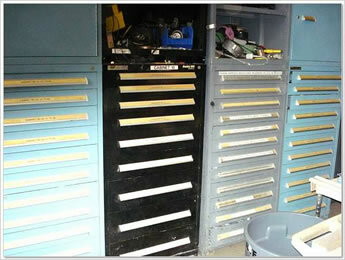 Next they moved on to selling a bunch of tool boxes, cabinets, and rolling carts. I ended buying eight RubberMaid rolling carts with toolboxes for $12 each. Bidding on these cabinets was intense. Every one of them sold for between $600 and $1200. I ended up not buying a single one. This machine was exceptionally tight. 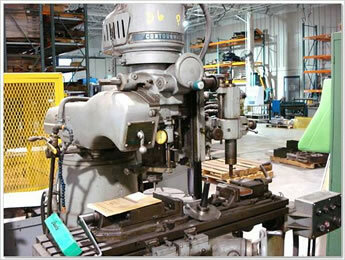 It included two milling vises, two rotary tables, a cooling pump and a hydraulic power supply. The mill sold for $450. 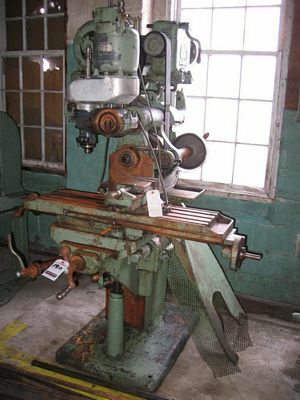 I bought a very nice little 25 Ton Die Press for $125, two granite surface plates for $10 & $25, three two door shop benches/cabinets for $15 each, and all the dies for the press for $15. I also ended up buying two metal storage cabinets that were full of shop vac filter, scotch brite pads and sandpaper for $65. The auction resumed inside at the forge. Prices on these items were generally low. The forges themselves brought $100 each. The manual drop hammers sold to the scrap guy for $100. These were really neat machines. They can’t be seen in the pictures, but all of the dies for spoons and other utensiles were included under the benches. Also in this area was a really nice set of antique anvils. There was alot of competition on these and they ended up selling for $850. The auctioneer kept making me cringe by picking up each hammer and striking the top of the anvils. The only item I purchased in this area was this EC single spindle buffer. It has a really nice surety guard that is lighted from the back. It sold for $35. Next they moved on to selling the machinery. 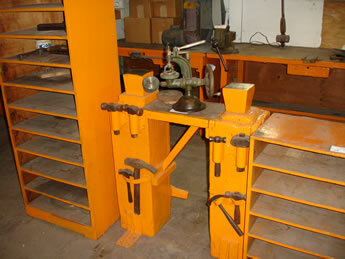 These consisted of mostly drop hammers, tinning presses, knuckle presses, rolling mills and a plating line. 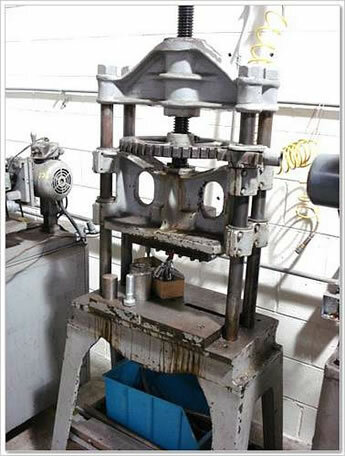 Nearly everyone of the drop presses sold for scrap at $100 each. The same was true of the tinning presses. 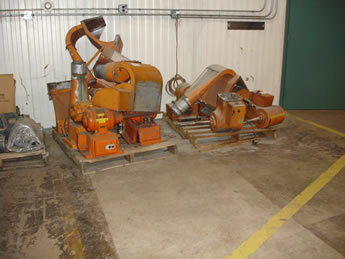 All brought $100 from the scrap man, except for a few Bliss presses that went for $3500. 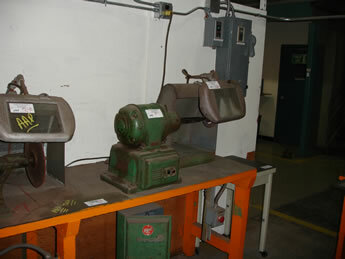 The smaller knuckle presses sold for scrap as well at $100 each. 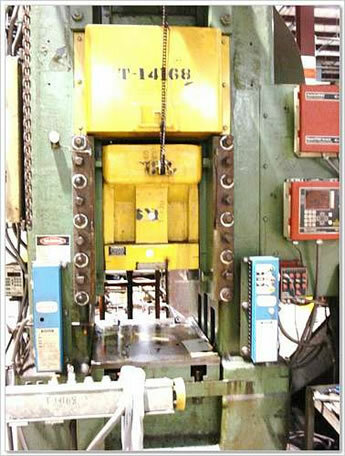 The 600 ton unit brought alot of interest and sold for $3200. 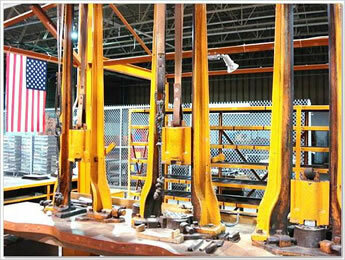 The rolling mills, plating lines, polishers, etc all sold for scrap. Some of them brought decent money. This was mostly due to the high brass content in the plating lines. The rest of the auction was misc machine parts, motors, storage tanks and junk that was piled in the last section of the building. Initially, the motors brought pretty good interest. The first two sold were 550 volt 50 HP. They sold for $300 each. 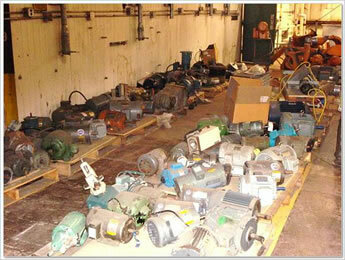 Then the auctioneer put the remaining motors up as a single lot. There had to be 100+ motors. They ended up selling for $2200 for the lot. Many of these were new in crates. 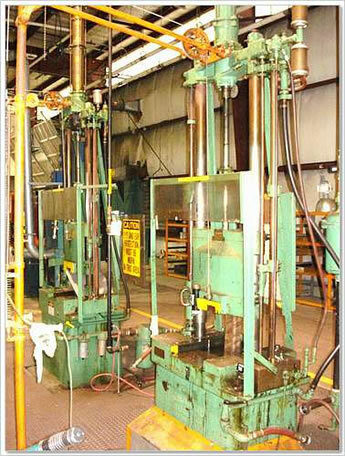 Also of interest in this area were two skids of EC single spindle buffers. These sold as a single lot for $100 to the scrap guy. I did manage to talk him into letting me take the extension spindles off of these before he trashed them. The auction ended in a storage room off the area with all the junk. This room had large tanks for storing ceramic material. I managed to buy a 15′ fiberglass step ladder for $100, and another 10′ step ladder for $35. Way back in the corner of this room was the only piece of wood working machinery in the sale. 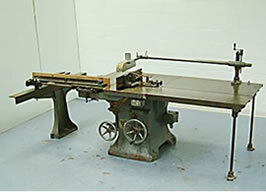 It was a large Holz sliding panel saw. I bid on it, but ended up letting it go to the scrap guy for $450. I liked the way the auctioneer conducted the sale, but things got very difficult starting with checkout. As soon as the sale was over I made a bee-line for the office to pay my bill. The girl running the checkout was doing all of her work from hand written receipts that had been given to her throughout the day. She would take these receipts and manually write out a bill. None of this was done in advance. I was told to leave my number and that I was 6th in line for checkout. They said I could wait outside, but that I couldn’t move anything until the bill was paid. I waited the 90 minutes until my number came up and then sat at the desk and waited another 20 minutes for my bill to be completed. Once the bill was paid, I went out and started collecting all of the small items as I was worried they might be spirited away. I hadn’t been doing this for more than five minutes when the auctioneer came by and said that everyone had to be out of the building in 15 minutes since they were all leaving. I quickly gathered up all the small stuff and went to checkout. The guy at the door then had to inspect each item and verify it against the yellow slips of paper. He would tear the corner off of each slip as he found the item. I ended up leaving all of the rolling carts and large tools for the next day. When I finally did get outside, I was surprised to see that it was still snowing. There was three inches on the ground and it was still coming down pretty good. When I got back the next day, things looked completely different. All of the tables, carts, and some machinery had been moved. I quickly realized that some of my stuff was missing. It turned out to be one set of pullers and a few carts that had disappeared. The auctioneer made good on these by giving me four carts that were not in the auction, one granite surface plate and another urethane belt splicer. I also managed to buy a large heat exchanger that weighed at least 600 lbs for $25, a large welding table for $25 and a few rolling dumpsters for $100 each. One final note: The toy soldier at the top of this article was on a key chain handed to me by the maintenance man at the factory right after I bought the cabinet full of filters. I didn’t think much of it at the time. When I got home, I took a closer look at it and discovered that it was made by Gorham at the Pomona plant. 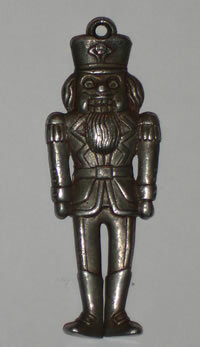 It’s made of sterling silver. Where is the part where you had your son move the heavy machinery around? Nice blog. Also, did you happen to wonder how much silver dust was leftover in the dust collectors? Some of the most intense bidding was on a number of 55 gallon drums that contained dust from the exhaust pipes and slag off the floor under the drop hammers. I had a similar experience where I bought a set og outdoor collectors from Isola in Franklin, New Hampshire. 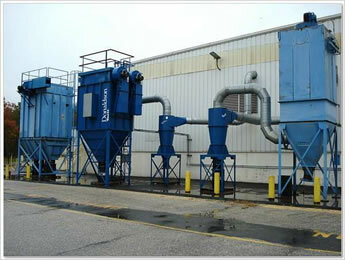 The bins were still attached to the dust collectors and were full of copper dust. I paid $100 for the collectors and ended up selling the content of the bins for a few thousand dollars. You never know what you’re going to get in these sales.